Pressure washer cost will vary based on the brand, model and its associated features. There are a lot of models to choose from, each with their own unique qualities. Sometimes the cost of a pressure washer comes down to what you plan on using it for. That is why heavy duty models cost more than lightweight electronic ones. You can save money upfront by figuring out the features you use the most and which ones you can’t live without. In the end it may turn out you don’t need an expensive pressure washer to get the job done. Consider this the area with the basics, the absolute minimum needed to make a pressure washer worth buying. Most pressure washers will come equipped with these features, so you’ll spend well below medium grade and high end costs but still get exactly what you need. When new innovations come out, you are forced to upgrade to meet new standards if they significantly improve the usefulness of the product. Low end pressure washers are still flexible for everyday use, with many consumers using them as a go to cleaning device. Low end pressure washers cost much less than any other type. You get the basic features that will allow you to do things like clean a patio, detail a car and many other light to medium tasks. You’ll also have more choices from the electricity powered models of pressure washer, since low end and medium grade are their most notable categories. So low end is also power efficient and practical for homes that support the interface. Any major innovation will force you to upgrade to enjoy the new features. Power is something that lacks in low end pressure washers, which is why gas powered pressure washers are better purchased from medium grade and high end types. There is a market for low end gas pressure washers, but you’re missing out on all of the things that make the gas versions worthwhile. Low end pressure washers are no more than one hundred dollars, even when they come bundled with accessories. When they are more than one hundred, there is a good chance the jump in price includes features that put it in medium or high end territory. This is the most purchased consumer type in the industry. It is balanced for power and price, and is therefore more likely to give you the best long-term value. A lot of the choices in this category come with a lot of accessories and special features. Modern advancements made to pressure washers happen at medium grade and high grade levels. So many of the cons you find in low end products don’t affect this category. Users that want pressure washers for casual projects might find medium grade to be overkill, but it is still worth investing in. Medium grade pressure washers have all of the great benefits associated with high end models, but without a big price. You’ll have access to a lot of the best accessories directly out of the box. That’s big savings upfront, even if you only wanted a couple of specific accessories. 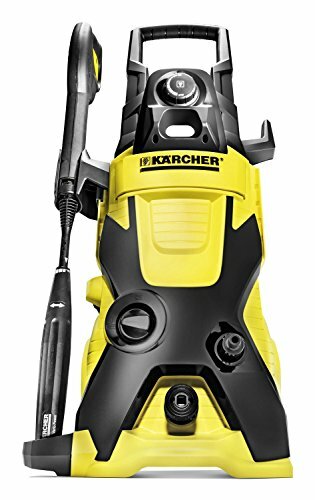 Consumers will also be introduced to gas powered models, which are more powerful than electric choices such as Karcher K4 electric pressure washer. Power settings and other useful features are built into the unit to help it transition from one type of a job to the next. Higher price is expected, but it gets a little weird when choosing electric models. You can get the best electric models in the low end category. Paying a medium grade price for an electric pressure washers will get you a few benefits, but not where the improvements will show the most (power). Up to two hundred eighty dollars is the expect price for medium grade. Anything more than that will put it into the high end territory where you’ll get massive power gains. Buyers should stay away from paying a premium for electric pressure washers in this category. High end pressure washers are usually reserved for businesses that take on bigger projects. That doesn’t mean consumers aren’t interested in the tech, as a lot of models in this category have found their way into a garage. High end models are the most powerful, yet don’t push innovation in other areas of its build. High end pressure washers are about pure power that separates itself from the other types available. If this type can’t handle the job, then there aren’t a lot of tools that can. Larger, more durable and comes with much better warranties. Their high usage rates almost guarantees that you’ll get a great warranty if you choose a reputable brand. They also have the highest PSI and GPM per model, making them absolute workhorses in the toughest environments. Heavier materials leads to better wheel design, usually with technology that keeps them from going flat. Since high end units are gas powered, their engines handle pressure water pump much better at the highest settings. Price is going to be at the top of the list. High end pressure washers are the most expensive of the bunch, but hold great value in projects with large scopes. And with the bulk of high end types being used in business, the gains are much higher since it contributes to the money making process. For the extra power you’ll have to spring for gas, which is an additional cost that will be cheap or expensive depending on where you live. It’s easy to just call it a day and order from the high end pressure washer category. You’d get everything in one package, even if you didn’t plan on using half the features. Careful planning will get you a lot of value for your money when choosing a pressure washer. Pressure washer for cleaning patio doesn’t require a high end unit, and in some cases may make things difficult due to the extra power. So getting the most expensive pressure washer available would cause more problems than getting one you need. Check out the features for each type so you can match them up with the project demands. Consumers that cross environments from home to business can get away with medium grade pressure washers, assuming that it’s powerful enough to keep up. Smaller businesses don’t have to default to getting the most expensive option, just like consumers don’t have to get the cheapest. And if home and work schedules mix where you’re using the same pressure washer daily, medium grade is built strong enough to handle the workload. Choosing from any of the three different pressure washer categories and things to know will give you different prices, and ultimately different experiences. The smartest thing is to look at which features are most important to get the best return on your investment. Have a look over number of other branded products and tools reviewed on our website including garage door openers to help you decide in details what is the best product for you to go for.